Yes, another current Laphroaig! How about that?! This one I always remember as "the Duty Free one" since it has a Gaelic name I always forget and never learn how to pronounce. I was a serious geek about all things Scottish long before I discovered scotch whisky. Hell, during my long Alba (Gaelic for Scotland!) stay in 2002 I drank only beer. Despite my love for that country, I find it difficult to take these whiskies with Gaelic names seriously. The names are designed by parent companies that are not even remotely Scottish but are trying to make their whiskies sound Scottisher to your ears and distract you from the fact that you're drinking very young whisky at an inflated price. But you've heard this all before. The Travel Retail-only An Cuan Mor (or Big Ocean) spent the majority of its maturation time in ex-bourbon barrels, then was finished, or "slept", in "the finest European oak", as per the official site. Thems some nice marketing words, but how long did it "sleep" and why does Laphroaig keep using artificial colorant in its products? I have a dozens of additional pissy questions, but I'm surly today so maybe I should just review the whisky. Maturation: finished in ex-sherry European oak for an unspecified amount of time after having been aged for an unspecified amount of time in "first-fill-only ex-American white oak bourbon barrels", as per the site. That's a weird place to put the "ex-". The barrels aren't former American white oak. They still are American white oak. Just call them first-fill ex-bourbon barrels, dudes. Its color is orange gold. 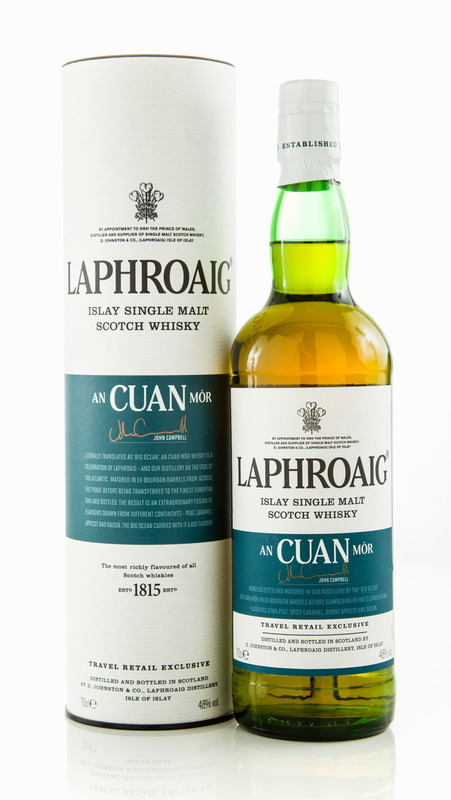 The nose is very pretty, gooey rich, for a Laphroaig. Laphroaig candy. 'Phroaig Phlowers. Fresh apricots with Ceylon cinnamon. Pecan pie and milk chocolate at the beach. Seaweed. The sherry/European oak character grows with time and starts to feel more like a second maturation than a quick finish. It picks up a bit of a barnyard note after awhile which brings more character to the package. It all fades away after 45 minutes, so don't wait so damn long. There's a deep, almost Ardbeg level of cinders in the palate, which is much drier and phenolic than the nose lets on. While there are notes of milk chocolate and confectioner's sugar, there's plenty of smoke and a good herbal bitterness to balance it out. Some bacon in there too, or maybe that's how my taste buds interpreted all of the salt and smoke. It gets sweeter with time and begins to pick up a big anise note. It gradually loses some peat but gets spicier and almost gingery. Big smoke on the finish, and an even more substantial sea salt note. A bit of charred meat, a little drying. It feels like the 10yo with more pepper, more sugar, and a longer finale. This was a lot better than I had expected. While the nose is richer than the palate, the palate is darker and peatier than the nose. But it's more of a drinker than a thinker since, as I mentioned, it fades out after 45 minutes in the glass. I like it better than the Triple Wood, perhaps because there's less woodwork futzing. In fact, if they just swapped this out for the Triple Wood (NAS for NAS), it wouldn't be a total tragedy. In the meantime, I'm happy to report that there's a decent NAS Duty Free whisky out there. I'm less happy to reveal the regrettable and odd $100-$150 price tag.